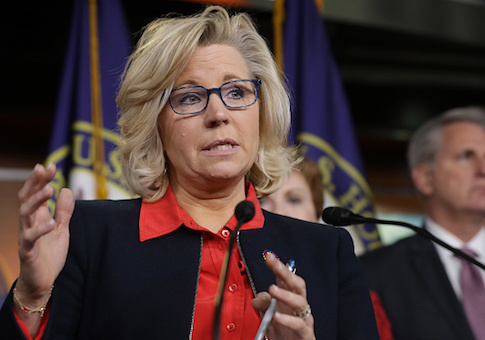 A group of 35 House lawmakers led by Rep. Liz Cheney (R., Wyo.) said in a letter that there is no reason Iran should be allowed to continue selling its crude oil under the Trump administration's maximum pressure campaign on Tehran. The State Department has been under fire from Congress and hardline members of the Trump administration to stop giving countries a pass to purchase Iranian crude. The Washington Free Beacon has reported this battle is part of ongoing debate within the administration over how far it will go in efforts to choke off the Iranian economy. After remaining silent on the matter for months, Iran hawks in both the House and Senate have told the State Department enough is enough. "Cutting Iran's oil exports to zero remains a key, and as yet unfulfilled, part of your administration's maximum pressure campaign," the lawmakers wrote in the Cheney-led letter." "State Department Special Representative for Iran Brian Hook said in January that 80 percent of Iran's revenues come from its oil exports. Forcing Iran off of its oil money would leave the country's leaders with a choice: they can either finance their own malicious terror schemes abroad, or they can support the Iranian people at home." "Since leaving the nuclear deal, your administration has squeezed Iran with an array of shrewd sanctions," the letter states. "This month, you took the unprecedented and necessary step of designating Iran's Islamic Revolutionary Guard Corps as a foreign terrorist organization. Now, in accordance with your maximum pressure campaign, the regime in Tehran must be pushed further. We urge you not to renew these oil exceptions and ensure that Iran's leaders are unable to put their death chants into action." This entry was posted in National Security and tagged Iran, Oil, Sanctions. Bookmark the permalink.